The North American Membrane Society (NAMS) is a key US technical society related to membranes. 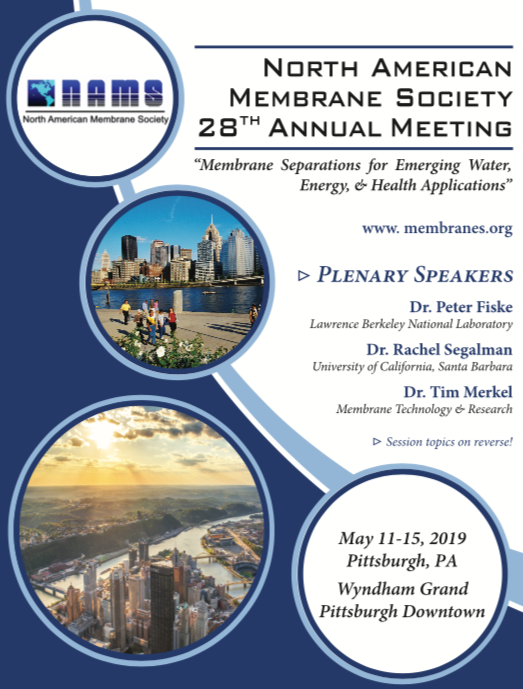 NAMS hosts an annual meeting, http://nams2019.org/, which will be 11-15 May, 2019 in Pittsburgh. 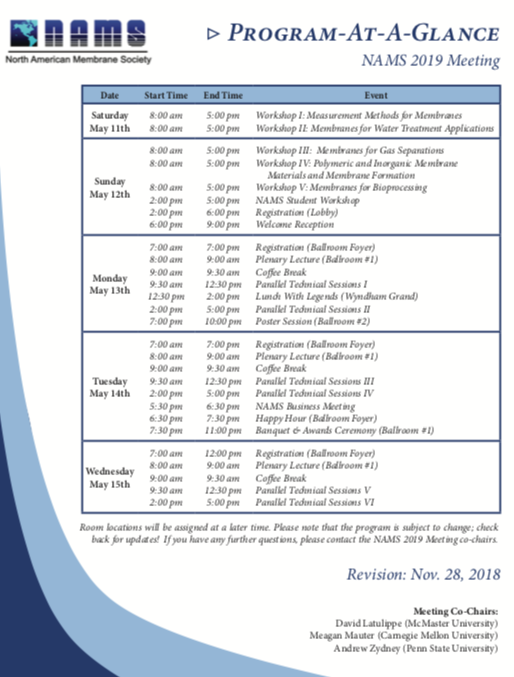 For M-WET researchers, there is a particularly exciting set of plenary speakers this year, including our very own M-WET Associate Director Rachel Segalman, Dr. Peter Fiske, Director of the Water-Energy Resilience Research Institute at LBNL, and Dr. Tim Merkel, Vice President of Technology at Membrane Technology and Research, Inc. Measurement Methods for Membranes. Presented by John Pellegrino (University of Colorado, Boulder), Ryan Lively (Georgia Tech), and Uwe Beuscher (W.L. Gore). Membranes for Water Treatment Applications. Presented by Isabel Escobar, Dibakar Bhattacharya (University of Kentucky) and Ben Weaver (Nanostone Water). Membranes for Gas Separations. Presented by Glenn Lipscomb (University of Toledo), Benny Freeman (University of Texas, Austin) and Tim Merkel (MTR Inc.). Polymeric and Inorganic Membrane Materials and Membrane Formation. Presented by Maria Coleman (University of Toledo) and Henk Verweij (Ohio State University). In addition to 3 days of oral presentations on various topics relevant to M-WET, NAMS always hosts a robust, highly interactive poster session, and many participants report meaningful research conversations and networking opportunities with leaders in the field at the poster sessions. 8 January 2019 – Award Applications Due. NAMS offers a variety of student travel, student fellowship and young membrane scientists awards, and I would strongly urge M-WET early career researcher to consider applying. 15 February 2019 – Abstract submission closes for both oral and poster presentations. In our group, if a student submits an abstract for an oral presentation, I would always encourage them to submit a poster abstract as well, given the excellent experience we have had with previous poster sessions. There are also cash prizes for best poster and oral presentation awards, and it would be fantastic to see M-WET well-represented when awards are announced.